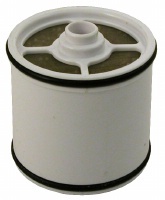 Replacement filter for Sprite Low-Offset Univesal shower filter. Filter lasts roughly 6 months. The Sprite Slim-Line replacement filter uses patented Chlorgon® and KDF 55 filtration media, which typically lasts six months or 10,000 gallons whichever comes first.